This is a mid Alabama Lake you just don’t hear much about…especially during the winter months. Jones Bluff Reservoir began with the building of Robert F. Henry Lock and dam in 1972. The lake is officially named, Lake Robert F. Henry and it stretches for over 80 miles. From Robert F. Henry lock and dam on the lakes lower end, to the lakes headwaters. These lake headwaters are actually tailrace waters coming off of two dams, on two major River Systems. The six impoundments that make up the Coosa River System all drain into Jones Bluff Lake. These Jones Bluff Lake headwaters are actually the discharge waters coming from the last lake in this series of six Coosa River System lakes found upstream, Jordan Lake’s – Walter F. Bouldin dam. Another influx of water enters these Jones Bluff lake headwaters. The Tallapoosa River coming off of Lake Martin dam, empties into Jones Bluff Lake and joins the Coosa River at a Y section in Jones Bluff Lake’s headwaters. This merging of these two major river systems forms the Alabama River. Not only is there over 80 miles of navigable water on this lake, but it is a rather spread out lake as well, especially evident in the mid-to-lower lake region of Jones Bluff. This lake consists of 373 miles of shoreline. It also features 16,300 square miles of some very fishy-looking feeder creeks and backwaters. 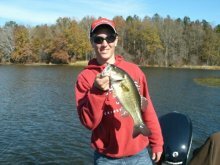 Which takes us back to winter bass fishing on Jones Bluff. Like most Alabama man made impoundments, the upper third of Jones Bluff resembles a river more than a lake. 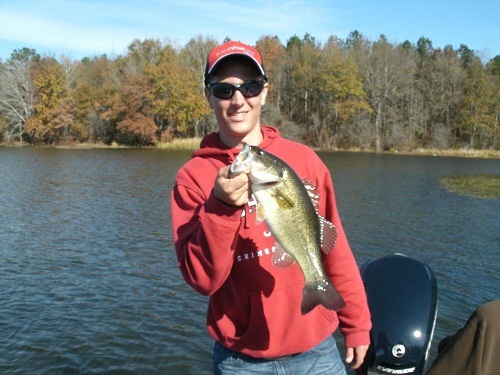 These lake headwaters do display some rather good places and favorable conditions for fishing for both spotted bass and largemouth bass during the spring, summer and fall seasons. Winter comes and everything changes in these lake headwaters…often for the worse. Seasonally, heavy winter rains can swell the lakes headwaters, places that mostly feature high river banks and no back water feeder creeks to absorb the fast rising waters. Lots of rain run-off from 8 lakes found upstream on two major river systems, is a lot of water coming downstream to Jones Bluff Lake. This rain run off can create some very heavily-stained to just plain muddy water conditions, often for weeks at a time in these Jones Bluff lake headwaters. Colder than normal water temperatures can occur here as well. Cold, swift, muddy water conditions – are the worse conditions an angler can face. Although most anglers know, rain run-off can suddenly warm the backs of major feeder creeks, incoming small streams and their adjoining flats, there are very few feeders in these Jones Bluff Lake headwaters. During winter, warm rain run-off only filters into the lakes found upstream of Jones Bluff Lake, cooling off very fast. Upstream dams release water coming from the deeper portions of upstream lakes. This is very cold water in winter. Cold water is heavier and it sinks to the lakes bottom. Coupled with 30-50 foot depths found on the lower ends of these upstream impoundments – Jordan Lake and Lake Martin – discharged water coming off of these upstream dams in Jones Bluff Lake headwaters, have very little time to heat up. * From Interstate 65 crossing to the Y section found upstream (where the two rivers join), would be the best places to explore during clear water conditions and winter warming trends in these Jones Bluff Lake headwaters. There are some big spotted bass and trophy sized largemouth bass that live here in these mid-to-lower lake regions, year round. 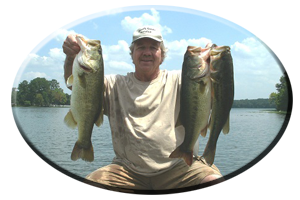 These bass have more room to roam and they get used to any wintertime condition that can arise. Just like bass living out their lives in the lakes headwaters. 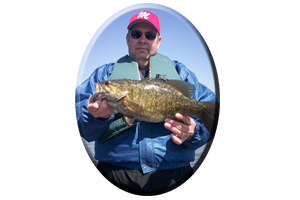 But, often these are easier-to-catch bass, bass that are usually living out their winter’s in more favorable conditions than their upstream relatives. So considering this past years drought and little or no rain, there are some places to consider, under these more favorable conditions this winter season. Prior to most winters here in mid Alabama we have plenty of rain. This keeps the lakes flushed out and clean. It also creates a constant current situation throughout the lakes, keeping the fish like Jones Bluff’s spotted bass very active and constantly feeding each day. Winter warming trends help the largemouth bite increase as well. Its all about the weather. Each winter season there are times, often for over a week or two, when air temperatures can suddenly soar. It can go from lows in the teens to air temps in the low 70′s, all in one week. Like it did the first week of January of this year. These winter warming trends display several, consecutive warm days and warm nights, bringing up the lakes water temperatures as much as 10 degrees in one week. Lake backwaters shielded from cold, winter winds and constant current, can get even warmer. This is where winter largemouth’s can be found among the lakes feeder creeks, flats and backwaters, places bathed in constant sunshine, that feature loads of baitfish and fish holding wood and weed cover. So as you can see, lures you would use in both fishing main river situations and targeting bass in feeder creeks and backwaters, can vary tremendously. No different than when selecting lures or fishing these lakes during the rest of the year. 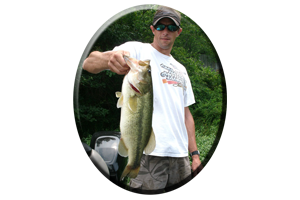 Including the use of topwater lures. Anytime I see a rising water temperature situation, I start getting my tackle ready and this always includes rigging up a few topwater lures. These winter waters on the Alabama River can easily be in the mid 40′s on any winter trip, prior to these winter warming trends. Tough conditions for seeking active bass, especially when trying to entice then to hit a well placed topwater lure. 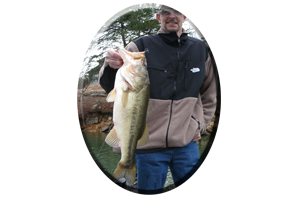 So wintertime anglers get accustomed to fishing Jones Bluff Lake with lures that are drug slowly across the lakes bottom or lures retrieved a little faster like spinnerbaits, crankbaits, suspending jerkbaits and rattling, lipless crankbait lures. But let the lakes water temperatures come up to 60 degrees (almost 15 degrees warmer during winter warming trends), and these same anglers fail to try a topwater lure. These Alabama River / Coosa River / Tallapoosa River – mixed breed of spotted bass – are mean! Like said many times before, ” it must be something in the water! ” They will blast a walking type topwater lure like a Heddon Zara Spook or Lucky Craft Sammie, when these conditions arise. A warm, rainy front makes it even better! 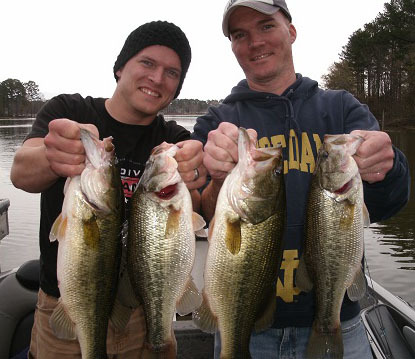 Main lake points, around islands, flats, creek mouths and along rock bluffs, are all big, spotted bass hangouts during the winter season on Jones Bluff Lake. The laying trees, logs, log jams, stumps, brush piles, rock cover and various types of aquatic weeds all found in Jones Bluff’s many feeder creeks or along main lake banks, are also good places to encounter some big, largemouth bass. 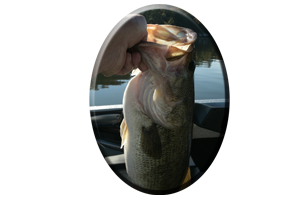 Using these previously mentioned lures and other lures like weedless lures and various types of shallow water lures fished from top to bottom…all throughout the winter season, works very well during or following these winter warming trends on Jones Bluff Lake!